Richmond, KY -- In light of recent occurrences, we at the Kentucky Equality Federation are issuing a statement to clarify our stance on the Statewide Fairness Coalition. There are certain items that need to be addressed explicitly, as they set us apart from other organizations within the equality movement. Kentucky Equality Federation does not hold traditional fundraisers or host "social hours." In addition, we will not do anything to endanger long-term equality to accomplish short-term victories. Kentucky Equality Federation is a founding member of the Statewide Fairness Coalition. Federation Board members and Regional Directors attended the first two meetings of its conception, but our Board voted to withdraw. 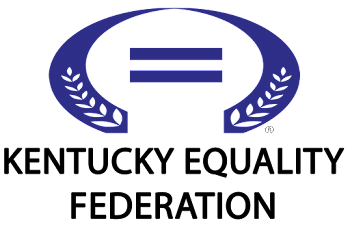 While we support the efforts of other equality organizations in the Commonwealth and do not seek to offend other groups in the Coalition, we have enjoyed better success and more flexibility as an organization independent of any official coalitions with Steering Committees. After conversations with the Statewide Fairness Coalition, namely Mr. Chris Hartman of the Louisville Fairness Campaign, Kentucky Equality Federation will begin to support the Statewide Fairness Coalition as an independent, non-member organization as our Chairman, President, and/or Public Relations and Media Director deem appropriate. This decision was reached after posing the question to our Board members, officers, regional directors, outreach directors, contributors of Kentucky Equality Federation's Official Blog, and standby volunteers. As always, we remain committed to working with other equality organizations, and we are glad to have good working relations with them. We will support them when appropriate, and we continue to serve as the largest all-volunteer equality organization in the Commonwealth. Our main goals at this point are to continue serving as public advocates for victims of abuse and discrimination, as well as preparing for the next legislative session in Frankfort. To that end, we plan to build our legislative advocacy network and public affairs infrastructure further in addition to working with StoryCorps to tell the stories of those who grew up LGBTI in Whitesburg and Lexington, as well as raising money to support HIV/AIDS organizations around the Commonwealth. Kentucky Equality Federation is also working to launch our "Faces of Equality" video series; to participate, contact us at: www.kyequality.org, and select "Faces of Equality Project." MEDIA INQUIRIES: Please contact the Public Relations and Media Director at (877) KEF - 5775 - Ext. 1. Good for Kentucky Equality Federation you are the bigger organization. You are making the entire movement in Kentucky weaker by agreeing to work with Louisville FC.